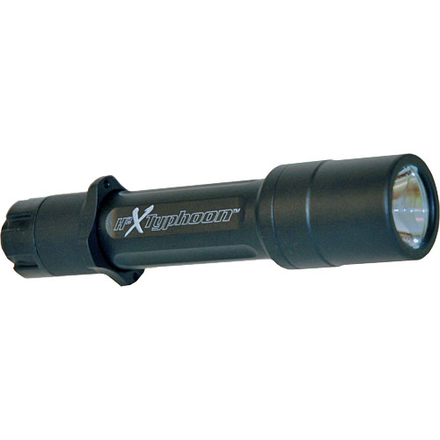 Insight H2X Typhoon is a multi-function shock proof and waterproof LED flashlight with an excellent beam quality of 80 lumen. Features an intelligent circuit for extended run time. Made of aluminum and coated with a hard anodized finish for strength and a tactile grip. Multiple modes include constant, momentary, strobe, dimming, and lock-out. Can be mounted to a firearm. Uses 2 3V CR123A batteries.